Recently six DWCA Members participated in a “Virtual Roundtable” discussion about the famous Dan Wesson SuperMag Revolvers. The unique Dan Wesson Revolver design was the perfect platform for the development of the powerful, flat shooting Super Magnum cartridges. Dan Wesson SuperMags are among the most actively collected modern revolvers. What does the term “SuperMag” mean? [IHMSA80x80] The old .38 Special case was lengthened to 1.29″ by Smith & Wesson back in 1935, to become the more powerful .357 Magnum. The same process was used by Elgin Gates in the mid 1970’s to invent an even more powerful round for handgun silhouette competition. 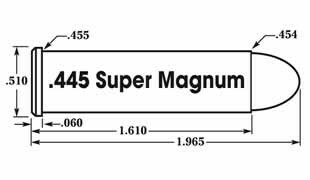 He lengthened the .357 Magnum case to 1.60″, and for lack of a better term, called it a Super Magnum, which was later shortened to SuperMag by Dan Wesson. How were the SuperMag cartridges developed? [ChargerFan] They were developed by Elgin Gates for the International Handgun Metallic Shooting Association (IHMSA). They needed to be able to retain enough bullet velocity at 200 meters, to knock down steel rams used in the sport. The first one Mr. Gates brought to the table was named the .357 Maximum…based on a .357 Magnum case, it was lengthened by 1.60 to allow more powder. Dan Wesson’s gun specifically designed for this cartridge was named the “SuperMag”. [IHMSA80x80] Elgin Gates, one of the early competitors and founder of the IHMSA, had many ideas for new cartridges for the new handgun game. One of them centered on the .357 Magnum. He reasoned that by lengthening the case even further, he could increase the velocity of those 170-180 grain bullets to make the round more reliable on the rams. By heli-arc welding sections of .357 Magnum cases together, he was able to come up with a lengthened case to use for testing. What role did Dan Wesson revolvers play in the development of Supermag cartridges? [IHMSA80x80] Dan Wesson played a huge role in the development of the SuperMag. When Elgin Gates designed the .357 SuperMag cartridge, Dan Wesson was the first revolver manufacturer to agree to build a new revolver with a frame window large enough, and cylinder long enough, to accommodate the full 1.610” case length. [Jody] Dan Wesson was the first (and only) firearms company to produce double-action revolvers in SuperMag calibers. [LBruce] At the time of SuperMag development Dan Wesson was the dominant revolver for IHMSA. With its proven strong design, superior accuracy and adjustable barrel it was a natural choice. What are the common Dan Wesson Supermag models, and in what calibers? [ChargerFan] Model 40/740(.357SM), 375(.375SM), 414/7414(.41SM) & 445/7445(.44SM.) The”7” denotes stainless. The 375 model was the only one not available in stainless. [IHMSA80x80] The .414 SuperMag is the rarest of all. Only 25 were built before the Palmer factory shut down in 1995. Again, they were 8” barrels with slotted shrouds, and all are stainless. How is a Dan Wesson SuperMag different from a Large Frame Dan Wesson revolver? [LBruce] The SuperMag frame and cylinder are lengthened to accept the longer cartridge. Also the ejector rod slot on the shroud is longer on a SuperMag. Most other parts interchange. [IHMSA80x80] The SuperMag frames are also heat-treated to safely withstand the rifle-like pressures developed with this cartridge. For what types of shooting are SuperMags most commonly used? [SHOOTIST357] Metallic Silhouette Competition and Hunting. [Supermagfan] They were developed primarily for the handgun silhouette sport, but most have also enjoyed success with handgun hunters all over the world as well. What level of accuracy would an experienced shooter hope to achieve with a SuperMag at longer (100+ yard) ranges? [LBruce] I believe near MOA type accuracy is possible, however mere mortals such as myself can strive for 2 inch groups at 100M and 4 to 6 inch groups at 200M. What is your favorite Dan Wesson Supermag Model/caliber, and why? [SHOOTIST357] I guess I like the 445 best. My wife, however, would choose the .357 for its lighter than model 715, recoil. [LBruce] I like them all but would have to pick the 357 SuperMag as my favorite. It was the first one and started the SuperMag following. Its exceptional accuracy, downrange energy, along with relatively mild recoil makes it an excellent choice for long range target work as well as hunting. [Jody] While my experience with the SuperMag revolvers is limited I enjoy shooting my .357 SuperMag over the 445 SuperMag. The recoil of the .357 SuperMag is very manageable in the Dan Wesson and a pleasure to shoot. [Supermagfan] I enjoy the .414 Supermag because I like the .41 caliber in general. I also enjoy the uncommonness of the caliber. There is a certain mystique about the caliber and it is the most collectible of the four regular production Supermag calibers. [ChargerFan] As of today, my favorite is the .375 SuperMag. To me, it has that perfect combination of weight vs. recoil, and it hits the target HARD! [IHMSA80x80] My favorite Dan Wesson SuperMag is my 740-V8S. It was my first Dan Wesson, and I purchased it new in 1986. My first ever perfect 40×40 score with a revolver was shot with this gun in 1988, and it was also the first shot by a Kentucky resident. What caliber would you like to see a modern Dan Wesson SuperMag type revolver chambered in? [ChargerFan] Something larger than anything else currently available…just because they can! [Supermagfan] The Gates family had spent some time developing a .32 caliber Supermag that never attained a production status. I think that would be a great new offering. There was also a .505 in the development stages that never hit the lines either, that would be one large caliber to compete with the 500 S&W and the Freedom arms 500 WE. Is there anything else that is important for us to know about Dan Wesson SuperMag revolvers? [ChargerFan] Yes…once you own one, you will want all four! [Jody] I think it should be mentioned that Dan Wesson was the first firearms company to manufacture production revolvers for the SuperMag cartridges. There’s currently a lot of hype about Smith & Wesson’s X-Frame revolvers but Dan Wesson was producing Big Bore handguns 2 decades before its introduction. We hope you have enjoyed and been enlightened by our discussion of the Dan Wesson SuperMag Revolvers. A site supporter badge, only available to those who have donated to support the Dan Wesson Forum. Access to the site supporters forum, only available to those who have donated to support Dan Wesson Forum. Become a site supporter today! Previous What Makes Dan Wesson Revolvers Unique?